Next version of popular Nvidia Shield will be a tablet and it will be called Nvidia Shield Tablet. And device just got certified by the Global Certification Forum (GCF). It was said that next version of Nvidia Shield might be revealed sooner than expected and it is happening now. Nvidia Shield is a gaming handheld based on Android Operating System. You can play Android game right on your Nvidia Shield or you can stream the game from a PC connected on the same Wi-Fi network with Nvidia graphic card installed. 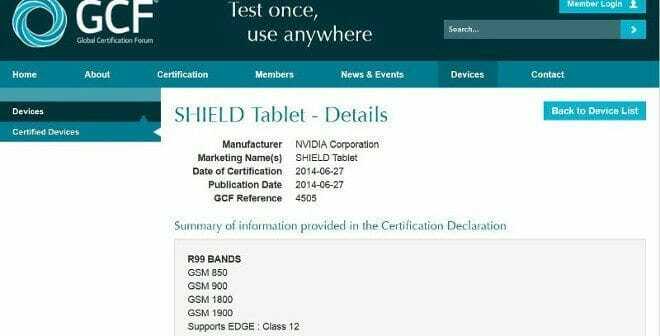 It appears that the new Nvidia Shield Tablet will be a great success over its predecessor. This is not all, The new Tablet will also support 3G and 4G connectivity along with Wi-Fi. Nvidia is making very powerful mobile chip sets like Nvidia Tegra K1, which is the most powerful mobile chipset available right now. And the new tablet will be based on a chipset that powerful. It will really revolutionize the mobile gaming industry. Specifications are not revealed yet but according to some previous leaks it will come with a 7.9-inch touchscreen with a resolution of 2048×1536. The tablet would dock into the gaming controller, but it would also be possible to use it on its own.